Through the use of new technologies, researchers, and practitioners in health education and health communication can now provide health information and behavior change strategies that are customized based on the unique needs, interests, and concerns of different individuals. These tailored health messages can be highly effective in assisting individuals in understanding and responding to health concerns. 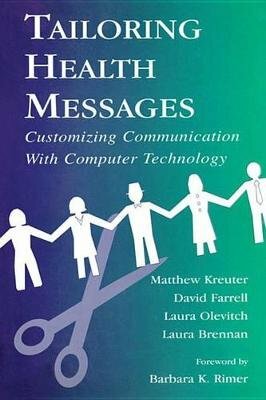 In this volume, Matthew Kreuter, David Farrell, and their colleagues define the process of tailoring and describe its uses in health communication programs. They present a theoretical and public health rationale for tailoring and support their position with empirical evidence. They also lay out the steps involved in creating and delivering tailored health communication programs, which can then be applied in practice. Practitioners, researchers, and students in health communication, health psychology, public health, and related areas will find this book to be a vital and invaluable resource for improving communication about health issues.